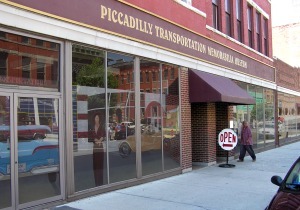 The Piccadilly Museum is located at 20 West Broadway in uptown Butte, Montana. Take Exit 124 to Eastbound I-115. After approximately one mile, the freeway will end and become Iron Street. Continue on Iron Street about one half mile to the traffic signal at Montana Street. Turn left on Montana Street, go nine blocks, and turn right on Broadway. The museum will be two blocks ahead on your right. Take Exit 126 and turn right turn on Montana Street. After approximately 3/4 mile you will pass through a major intersection at Iron Street. Proceed straight through, go nine more blocks, and turn right on Broadway. The museum will be two blocks ahead on your right.